A step-by-step guide to checking the output from a Lucas dynamo and tracking down potential faults. This guide to testing a Lucas dynamo is based upon my experiences with my 1951 Matchless G3LS, although the same principles should apply to other Matchless and AJS bikes (and indeed to other bikes and cars of the same era which also use the Lucas dynamo charging system). The aim is to guide you through a series of tests that can be performed with the dynamo still installed on the bike to check that it is working correctly and giving an appropriate voltage output, or to help to pinpoint potential problems if not. Note that the voltages described are applicable to the standard 6 volt dynamos and to those which have been reconfigured to give 12v output using a modern electronic regulator. The voltages from dynamos which have been ‘upgraded’ with 12v coils will of course be proportionally higher. Also, my bike has been re-wired so don’t go by the colours of the wiring shown as these will almost certainly be different to your bike. The Lucas dynamo types that this article specifically applies to are models E3L, E3LM, E3N and E3NL. All of these dynamo models are designed for 6 volt electrical systems (the actual output is much higher though) and are of basically the same design except for a few small differences. Models E3L and E3LM are both 60 Watt units; the difference between them is only the design of the mounting plate for fitment to the engine crankcase or MagDyno respectively. Model E3N is a shorter unit which only gives 45 Watts output, and the E3NL is just a slight variation of this. However the same principles can be applied to all types of Lucas dynamo. The dynamo fitted to my bike is a Lucas model “E3NL.0” although I haven’t found many references to this model number elsewhere. I suspect it is basically the same as the Lucas E3N model as it is stamped with a “5” and seems to give about 5 Amps output which is the same as quoted for the E3N. It is also stamped with a “54” which I am assuming is the year which would mean it is a non-original replacement for my 1951 Matchless. What voltage readings should I get? 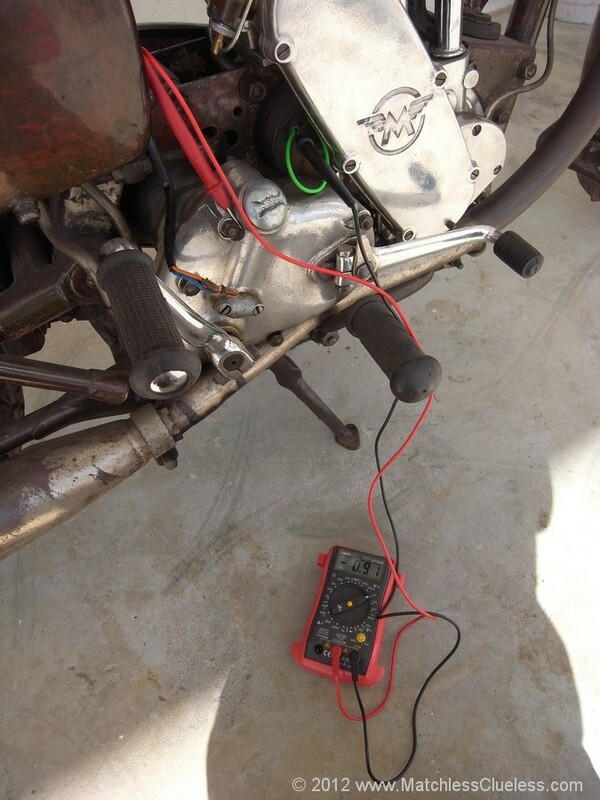 The easiest way to test a whether a Lucas dynamo is working correctly with it still fitted to the bike is to disconnect the output wires and check what voltage it is producing. You’ll need a relatively accurate multimeter for this test set on a range of up to 15 or 20 volts DC; dynamos are direct current devices, not alternating current (AC) like an alternator. The original Matchless service manuals suggest using an analogue meter (i.e. one with a moving needle) as this will allow you to see whether the voltage output rises smoothly as the engine revs increase. However, I guess most people will probably have a digital multimeter these days and these are perfectly fine too. Whichever type you have, just make sure you connect the tests leads correctly as described below. The first thing you need to do is to disconnect the two wires which come out of the back of the dynamo and which connect it to the regulator unit, as shown in the photos. There should be a screw between the two wires on the back of the dynamo which holds in place a small plastic plate which secures the two wires – you’ll need to remove this (it is missing from my dynamo in the photos) and also pull back the rubber cover if fitted. The two wires can then just be gently pulled out. They should just be bent over small brass ferules and so might be tight if they’ve not been removed for a while. Remove them carefully as you’ll need to refit them later and you don’t want them all bent. I found the easiest way was to pull on the exposed ends of the brass ferules using pliers whilst also gently tugging on the wires. If you just pull on the wires, you might find that the cable breaks leaving the ferule stuck inside. The photo below shows the dynamo with the two wires removed ready for testing. While you’re here, it might also be worth cleaning the ferules with some wire wool (or similar) to ensure a good electrical connection to the dynamo when you put it back together. 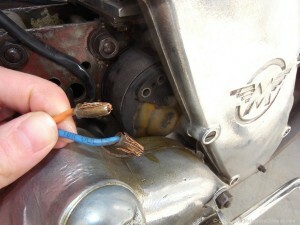 Once the two output wires to the regulator are removed, you then need to connect the two dynamo terminals together using a short length of wire. Some thickish multicore copper wire is best such as the sort used for household wiring. Get a short length (about 6″ long) and bare about 1/2″ of wire each end, but don’t twist the bare ends. Next bend the bared ends of the wires back on themselves and maybe spray them out slightly. You should now have a suitable link wire which can be inserted between the two dynamo terminals; the bent-over bared ends of the wire should be enough to make a good connection and hold it in place without using the brass ferules. Now you need to double check whether your bike is wired positive or negative earth. If you’re not sure, then the easiest way is to have a look at the battery and see which terminal is connected to the frame of the bike. If the positive terminal of the battery is connected to the frame of the bike then it’s wired positive earth. If the negative terminal is connected to the bike frame, then it’s negative earth. Simple as that! 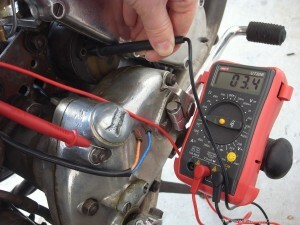 You now need to connect the two test leads of your multimeter between the Lucas dynamo and the bike frame to measure the voltage difference between the dynamo and earth. 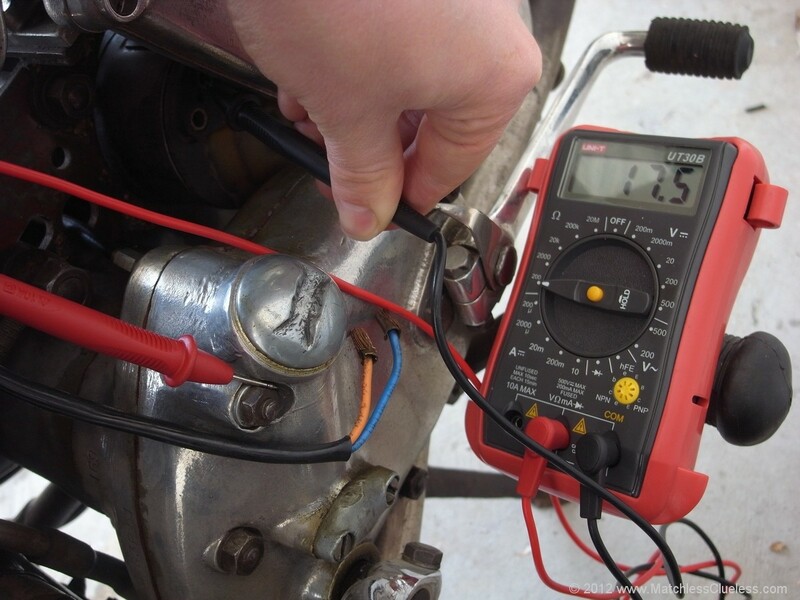 Now here’s the bit you need to get right: if you’re bike is wired positive earth, then connect the positive (red) test lead of the multimeter to a suitable earth point on the bike. 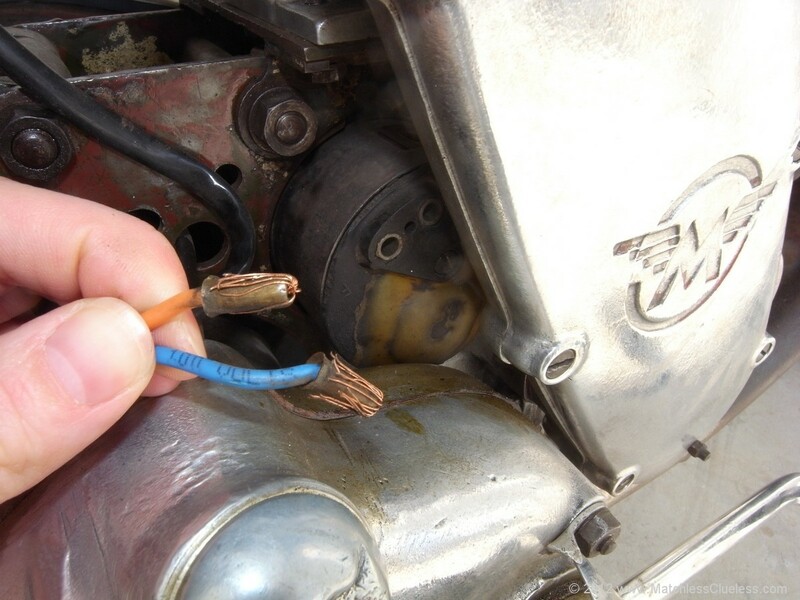 Conversely, if your bike is wired negative earth, then connect the negative (black) test lead of the multimeter to a suitable earth point on the engine, gearbox or frame. My bike is positive earth and so the photo below shows the negative lead of the multimeter inserted into the dynamo terminals. The earth point can be anywhere on some bare metal, but somewhere on the engine is probably best to ensure a good earth. I found that I could wedge the end of the test lead down the side of one of the engine casing nuts and this was enough to hold it in place long enough for the test. The other test lead (i.e. the negative test lead if the bike is positive earth, or the positive test lead if the bike is negative earth) needs to be connected to the dynamo. It doesn’t matter into which of the two dynamo terminals you connect it as you have already connected the two together with the short length of wire. You should just be able to put the test lead into the terminal along side the length of wire and that should be enough to hold it and give a good connection. Turn the multimeter on and set it to the voltage measuring range for 0 to 10v, or perhaps 0 to 20v on some models. Check that the meter reading is 0.00v (or thereabouts) with the bike engine not running; if not, you might need to zero the meter first, although most modern meters do this automatically. Also make sure that you have it set to measure DC (direct current) voltages and not AC (alternating current) as a dynamo produces a constant voltage. Now you need to start the bike. Note that it is very important that with the temporary connections we have made across the dynamo, that we DO NOT rev the engine too highly as this could damage the dynamo. Also we don’t really want to run the engine for longer than we have to for the same reason. Get the engine running and let it settle down to a normal tick over (idle) speed. With the engine running at idle, the multimeter should be reading a couple of volts output from the dynamo. Gradually increase the engine speed to a fast tick-over and watch the multimeter. The voltage output should rise steadily with increasing revs, but DO NOT rev the engine so much that the output exceeds 10 volts as this could cause damage to the dynamo. When you release the throttle and the engine settles back to tick-over, the voltage should also fall back down to just a couple of volts. Make a note of the range of voltages that you’re getting from the dynamo at the different engine speeds. Also note the polarity of the voltages (i.e. whether the meter is displaying the negative (-) sign in front of the numbers). 6. What voltage readings should I get? When the engine is idling at tick-over, you should hopefully see a reading of around 1 or 2 volts, depending of course just how quickly you have the tick-over set. As you increase the engine speed up to a fast tick-over (say around 1000rpm), the voltage output should rise smoothly to somewhere above around 7 to 8 volts. The output needs to exceed the battery voltage (i.e. 6 volts) in order for it to charge. There should be no need to race the engine in order to get this sort of output and remember that exceeding 10 volts or so may damage the dynamo. The charging system is designed to work (i.e. put charge into the battery) when you’re driving along at a steady 25-30mph, so it will need to be putting out at least 7 volts at the engine speed required to ride at this speed in top gear. There should be no need to race the engine to get a reasonable voltage output, otherwise the battery has no chance of being charged under normal riding conditions. If you’re not getting this sort of reading, then move on to Step 7 below to check the possible reasons. Also, note that the voltage output should be positive (i.e. no negative sign in front of the reading on a digital multimeter). Even though the Lucas dynamos were designed to work with 6v electrical systems, their actual maximum voltage output is much higher – 14 volts or more would be normal. It is therefore possible to convert the charging system to 12 volt operation (and thereby charge a 12v battery) without having to modify the dynamo at all. This is described further in my article ‘Converting to 12 volts‘. All that is required is to replace the original electro-mechanical voltage regulator with a modern electronic version. However it is not desirable to test the dynamo at these voltages with it connected as it is at the moment as it has no load on it and the two terminals are shorted together. Checking that it outputs up to 7 or 8 volts at a fast tick-over is good enough for now, irrespective of whether your bike is running at 6 or 12 volts. No voltage output – Ok, so there’s no voltage reading at all on the multimeter? First you’ll need to check that the test leads are making a good connection. Try giving them a wiggle whilst the engine is running and see if the meter reading changes at all. Also try a different earthing point in case the one you have isn’t good; any bare metal part of the engine should be fine. Lastly, check that the multimeter is set to read DC voltage (not AC, current or resistance etc) and is set to an appropriate range (0-10v or 0-20v say). Try measuring the voltage across the battery to check you get a sensible reading to be sure the multimeter is working. If you’ve done all these checks and there’s still nothing, then sadly your dynamo is most likely well and truly dead. The service manual suggests that the cause of no voltage output is probably the brushes, but it might be worth completing the resistance checks described below to see if you can narrow down where the problem lies. It might also be worth trying to repolarise the dynamo, as is discussed later in this article. Low voltage output of approximately 0.5v – If you get a low voltage reading of about half a volt then the service manual suggests that the problem is probably with the field winding. The resistance checks described below may help to confirm this diagnosis, but either way the dynamo will probably need to be removed from the bike for servicing. Low voltage output of between about 1.5 to 2.0v – If you get a slightly higher (but still low) maximum voltage reading of between about 1.5 and 2.0 volts then the service manual suggests that the armature winding may be at fault. Again, the resistance checks described below may help to confirm where the problem lies, then the dynamo will probably need to be removed for servicing. Negative voltage output – The first thing to check is that you have the test leads around the correct way as described in section 3 of this article. The leads need to go different ways around depending upon whether your bike is positive or negative earth. If the leads are correct, then it looks like the dynamo is incorrectly polarised and so is giving a negative (rather than positive) voltage output, just like my bike is doing in one of the photos above. This will prevent the battery charging properly, but can easily be corrected by re-polarising the dynamo as described in my ‘Repolarising a Lucas dynamo‘ article, as discussed further below. Further checks can be conducted on a Lucas dynamo to confirm its correct operation (or narrow down the source of a charging problem) by measuring the electrical resistance of its internal wiring. To do this we first need to remove the multimeter test leads and also the temporary wire we inserted between the two output terminals of the dynamo. You’ll also need to make sure the multimeter you have is fairly accurate and zeroed before use as the resistances we need to measure should hopefully be very small. Change your multimeter on to resistance measuring mode and select the lowest range (on my multimeter this was 0-200 Ohms). The best way to check it’s zeroed is to connect the two test leads directly together and see what resistance is measured. If this isn’t zero check you have it on the correct setting, then make a note of the reading so you can subtract it from the dynamo resistances you measure later. The offset might only be a fraction of an Ohm, but the resistances you’ll be measuring are also rather small so even the smallest non-zero reading at this stage could be quite significant. Connect one test lead (it doesn’t matter which one for resistance measurements) to a suitable earth point, again somewhere on a bare metal part of the engine is probably best. Then poke the other test lead into the ‘Field’ (F) terminal on the dynamo and measure the resistance. The two terminals should be labelled with “F” and “D” so you know which is which. If not, the ‘Field’ terminal should be the one of the left (see where the test lead is poked in the photo on the right) and the ‘Dynamo’ terminal the one on the right (where the test lead is inserted in the photo below). You should hopefully get a reading of around 3.0 Ohms – the manufacturers original service manual specifies 2.8 to 3.2 Ohms depending upon the exact model of the Lucas dynamo in question. If there is less or zero resistance, then you might well have a short in the field winding. If there is a very high resistance (i.e. no continuity) then there is probably a break in the field winding. My bike gave a reading of 3.4 Ohms as you can see in the photo, but the ‘zero’ reading on my multimeter was 0.3 Ohms so the actual resistance was around 3.1 Ohms. I was more than happy with that! Next, take the test lead out of the ‘Field’ (F) terminal and instead poke it into the ‘Dynamo’ (D) terminal on the back of the dynamo. The earth lead can remain in the same place. According to various sources I’ve come across on the internet, the dynamo winding resistance should be around 0.6 Ohms. However, my bike gave a reading of 17.2 Ohms (17.5 Ohms on the meter minus the 0.3 Ohms zero offset) and the dynamo appears to be working fine. On the other hand, my dynamo did completely fail about a year after I originally conducted these tests and wrote this article, so the higher resistance could have been a sign of problems developing. I guess if the resistance is anything significantly more than these sorts of readings then you might conclude that there are some bad connections somewhere within the dynamo. On the other hand, no resistance (i.e. continuity) might indicate a short somewhere in the dynamo winding. I can’t be any more precise at the moment I’m afraid, but I will update the guide if I find any new information. Similarly if you can provide further information, please leave me a message using the comment form at the bottom of this page. Using a multimeter to test the dynamo output voltage and winding resistances is useful as it gives you hard numbers to compare with known ‘good’ readings. However, the multimeter does not impose any load on the dynamo and so such tests will not tell you how the dynamo will perform under-load (i.e. with headlights on etc). Some faults may only occur under load with the dynamo appearing fine when nothing is connected. Other times you might get a good voltage output, but not enough current output to charge the battery and run the lights. Therefore a useful secondary test method is to check the dynamo’s output using a bulb as both a load and also as an indication of what power is being produced. This low-tech approach won’t give you any actual readings, but you should be able to gauge whether the dynamo is outputting sufficient current and voltage for normal operation. A spare headlamp bulb of between about 25 to 35 Watts is probably best as this is close to the rated 45 Watt power output of the dynamo (note bigger 60 Watt dynamos might need a bigger, say 50 to 60 Watt, bulb). The bulb should be 12 volt even if your bike is still set up for the standard 6v operation as the actual voltage produced is much higher. You might end up blowing the bulb in the test (as the dynamo output you’ll be testing is unregulated) so use a spare / old bulb rather than the one sat in your headlamp! The bulb needs to be connected to the dynamo in exactly the same way as the multimeter was connected back in section 3 of this article for the first voltage measurement test. Start by re-fitting the jumper wire between the two dynamo terminals to join the Field and Dynamo coils together, then use a length of wire to connect this combined output to the bulb. 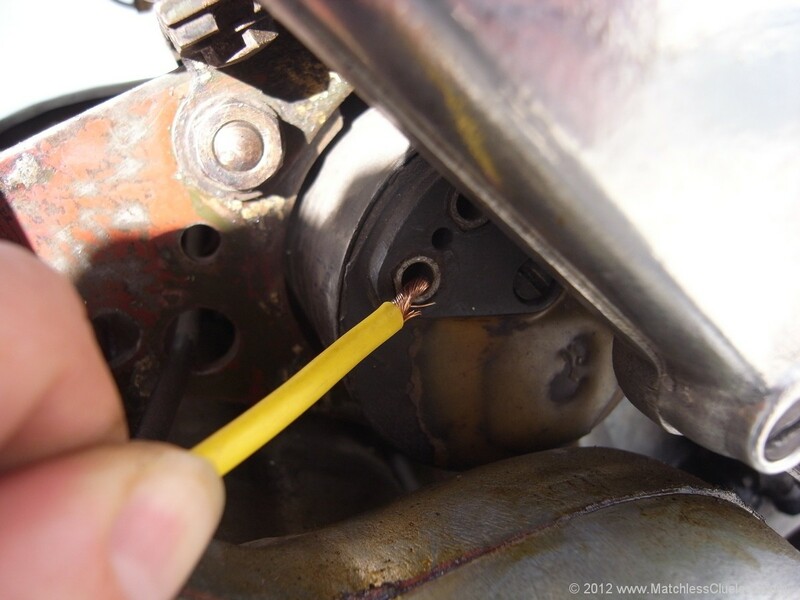 A further length of wire can be used to connect the other terminal on the bulb to a suitable earth point on the bike, or you can simply touch the bulb base onto the engine to give the ground connection. Either way, be careful you don’t short-circuit the dynamo output to the earth point. Start the engine and at tick-over there probably won’t be much to see. But as you raise the engine revs (not too high though!) the bulb should start to light up and become very bright. Remember that the dynamo voltage here is unregulated so the voltage is (or at least should be!) higher than the normal operating voltage of the bike; a 6v dynamo produces well over 10 volts at moderate revs, and over 12v at faster speeds. So it is easy to blow your bulb with too many volts if you rev the engine too fast. If the dynamo is working as it should, then the bulb should glow brightly without needing to race the engine. Obviously the exact brightness will depend upon the wattage and voltage rating of the test bulb you’re using. If it stays dim or doesn’t light up at all then this indicates that there is perhaps a problem with the voltage output under load. If the dynamo passes both the multimeter and bulb tests as described then chances are that it’s good and any problems probably lie elsewhere in the charging system, such as with the regulator (see ‘Replacing the regulator unit’) or battery (see ‘Motorcycle battery voltages‘ or ‘Selecting a new battery‘). Either way you can be reasonably sure it’s not the dynamo that is at fault. The classic Lucas dynamos discussed in this article do not have a strong permanent magnet inside them. Instead, a magnetic field is induced in the Field coil inside the dynamo by passing current through it, thereby generating a stronger induced current to flow out of the Dynamo coil. In order to initialise power generation when the engine is first started, a small amount of residual magnetism needs to be left in the core of the dynamo from the last time it ran. However if the bike hasn’t run for a long time, or the dynamo has been knocked, damaged or incorrectly connected, then this residual magnetic field might have disappeared and so the dynamo won’t spring back into life. This can easily be rectified by ‘repolarising’ or ‘flashing’ the dynamo which basically re-establishes this residual magnetic field. This can correct the zero or negative output voltages that you may have come across when performing the multimeter measurements described at the start of this guide. The full process is described in my article ‘Repolarising a Lucas dynamo‘ which is well worth a read as it could help bring your dynamo back to life without needing to remove it from the bike. Just a quick update to the preceding article concerning my own Lucas E3NL dynamo. My magneto stopped producing a spark recently so I took the opportunity to get my dynamo reconditioned at the same time as its output seemed to have become somewhat intermittent. I got both parts back on the bike last week and went on my first test ride yesterday. 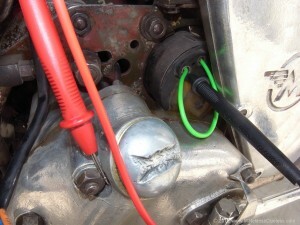 I connected up a voltmeter to the two dynamo terminals after installation on the bike (as described earlier in this article) to check the output and found that I was getting a good voltage output at much lower rev’s than before. It was only necessary to take the bike to a fast tickover (the sort of speed you might run the bike with the choke on when warming up) in order to get an output of 7 or 8 volts. On the road, the ammeter moved to the right (up to about 4 Amps) at reasonable rev’s until the battery was fully charged, then the needle sat happily in the middle. With headlights on (35W headlamp plus 5W rear bulb) the dynamo was able to balance the power drain when cruising along. In top gear, the needle was in the middle above speeds of about 55kph (35mph), although my bike is lower geared than standard which probably helps. Any faster and I’m even getting a slight charge into the battery in addition to powering the lights! So this proves that even a short (45 Watt) 6v Lucas dynamo can happily run a bike at 12v, even at night with headlamps on. The dynamo does need to be in good condition though and a good high-capacity (8Ah+) battery is essential. The larger (60 Watt) Lucas dynamos should therefore have no problem doing the same. You can view the full list of articles by hovering your mouse over the ‘Electrical Guides‘ heading at the top of this page. Hopefully by this stage you will have some idea whether your Lucas dynamo is working or not. If it seems to be fine but your battery is still not getting charged, then you probably need to have a look at the voltage regular unit next. If one or more of the test described above has highlighted a problem, then it’s probably time to get the help of an expert to service, refurbish and/or rewind the dynamo unit. For this it will need to be removed from the bike. I would welcome your feedback and suggestions for improving or correcting anything that you think is not correct in the guide. Please leave me your comments below. What a WONDERFUL piece of kind helpful work you have done, For me i am very inpressed. The real test will come in a few days when I come to put my own electricals back together after a mag and dyno rebuild following my own previous instructions. Expect some updates and corrections in the next few weeks perhaps! My A10 6 volt gen produces less output (headlight dims) at higher RPM, replaced reg, no difference. New brushes. Very clear and very helpful. Thanks for doing this James. Very useful for an electrical dunce such as I – much appreciated and a great help. Old bikes eh? Who’d have ’em? I have at the moment got my Lucas dynamo off the bike (as it’s in pieces) and want to test it 1) before putting it back or 2) before sending it away for someone else to check. Good question! I’m not exactly sure of the RPM of the Lucas dynamo at tickover without working out the gearing etc, but I don’t think this is too critical really. You can give the dynamo a good test by connecting it up to a voltmeter (or spare headlamp bulb) as described in the above article, then spinning it using a battery drill. Be careful not to damage the thread of the end of the dynamo shaft though, so putting this directly in the drill chuck probably isn’t a good idea. Maybe try pushing some flexible tubing (e.g. short bit of hosepipe) over the dynamo shaft and the other end of this into the chuck of the drill; this will give you a flexible connection between drill and dynamo which will also take up any misalignment. A battery drill should spin fast enough to get a reasonable output out of the dynamo allowing you to check how it’s working and whether it’s correctly polarised. The other option is to ‘motor’ the dynamo; I haven’t covered this on my blog yet (always meant to!) but have a search on the web and you should find something. Basically you connect the dynamo up to a suitable battery and it should spin like a motor (a dynamo and motor are basically the same thing but connected the opposite way round). The theory being that if it works as a motor then it should work as a dynamo too. A very good fact filled article on Lucas dynamos, I had to replace the armature on my E3HM and it was a great help. I did have a problem,when the dynamo was put back together,the armature was stiff to turn. MANY hours later I discovered that the armature was rubbing on the pole shoe that held the Field coil to the outer case. It transpired that the new armature was 5 thou thicker than the old one! ( Metric coversion maybe !!) The cure was to remove the Pole Shoe and grind 5 thou off the base where it screwed to the outer case. Job done. NOTE: My dynamo has a felt washer ( which was missing) at the commutator end which is oiled (via oil hole ) to lubricate the bronze bush. This had worn and had to be replaced as well. Glad you found the above dynamo article useful and thanks for adding your own tips and experiences. Hello, I have a 1951 Matchless Motorcycle with a Lucas Dynamo. I am unsure what the device that the dynamo is fastened on top of is called but thats what I am having issues with. I have noticed the battery is a 6v 2A when I think it should be a 6v 6A. Should the regulator click when I connect it up? Im having trouble getting a spark. The dynamo, battery and regulator will have no affect on whether or not you have a spark assuming you have the standard magneto ignition system (i.e. not a modern electronic ignition conversion). Try changing the spark plug or servicing the points, otherwise your magneto may need reconditioning. 1. Number of windings in the field coil? 2. Approx weight of the coil (This would help in finding the no of windings). 3. Gauge of the wire. what a great site – well done – I’m not stupid by no means, but electrics leave me cold – I will check the dynamo out first thing tomorrow – great easy instruction – thankyou. Superb info- have followed your site to do a 12v upgrade A10. and a no charge issue B31 with a problem, have you heard of this? All works fine balancing a 4 amp. discharge perfect, after 5 mins running with lights on it creeps back to 4amp discharge. Leave till cold same again all good for few mins, gone again. Hi Brian. Not sure of what your symptoms could be I’m afraid. I’m assuming you have fitting a solid state regulator, right? Maybe the dynamo is failing and starting to break down when warm – try measuring the output voltage direct at the terminals and see whether this drops off (as per instructions above). If that’s fine then check the battery is good by fully charging it, then connecting a load (spare head or brake light bulb perhaps) and make sure it gives a consistent output for half-hour or so. Also double check the charge voltage at the battery terminals to see whether the regulator might be at fault. Hi James, a bit more info re the B31. When I bought the bike it did not charge, checked dynamo as per your guide and found duff armature, field coils whilst looked old was spot on at 3.1ohms. Got a DVR 2 reg. following your recommendation I found 10v at link wire L to D at say 1200 rpm. 7.3v at regulator. Tried another known good batt. Even sent the reg back to the very helpful Dynamo Regulators Ltd for testing, all ok. I wish I had changed field coil when I replaced armature but as I said its resistence check was ok.Did the 12v65w load test but not for long so will test for longer as you suggest, will let you know how I get on.Thanks for comments so far. Have been in touch before re 6v dynamo BSA B31. Left it for a while ,any ideas? Rebuilt dynamo(new field coil, new armature, output good until under load. Tried the 12v50w bulb test and a glimmer at idle, very Bright at 1500 rpm and just fades away to below a normal 12v situation. On bike it balances head lamp 6v35w for a minute then loses it to -3amp. Think I may say sod it and make it a day time bike, but I hate to be beaten. Hi Sunil. You should get more than 9v at a fast tickover, the sort of engine speed you’d get with the choke in when starting the bike. Hi James Thanks for comments. at the last attempt I have replaced field coil and the Bakelite end plate as it had a crack, still same, as now all parts inside have been replaced, I have contacted my supplier who is dumbfounded as well, but has offered to replace parts as necessary foc to get to the answer. All parts are from Wassell ( made in Britain )!!! Guess will start with armature. Thanks again. Yes I have had the same problem with my ZB31 and it was the fibre gear slipping . After I fixed it all was good . It had a broken spring that clamps the gear . I am happy to find this site. Will be lot useful for me in the future. I am looking for a dynamo for my 1942 model matchless. It was burnt and missing when I bought it. Can you please let me know where can I buy this. Contact number and e-mail will be useful. Great info J helps heaps thanks but I have a problem with the dynamo I have and wonder if you can provide any thoughts. The details on my unit are: EL3 – AC 6v (Not sure what the other numbers are for: 20010A and 25 after the rotation direction arrow) I need to replace a brush as one wire is only held in place by the spring but I tried your tests and the field resistance is 2.6 ohms maybe a little low but should be okay, and the dynamo resistance is 0.6-0.7 ohms.So all looked good until I do the voltage test. When I spin the ammature I get – 0.13 volts when the D and F terminals are connected. I am testing it off the bike and spinning it with a cordless drill due to the fault being to hard to sort out on the bike. Following your tips I tried to flash the unit and as I have a neg earth I connected the neg to the case of the dynamo and touched the F terminal 3-4 times for about a sec or two using jumper leads. Only get a small spark compared to direct short but it did clearly arc. Do you have any other test I can try or any ideas for this problem. Hi, Very grateful to you for the unvaluable help about how to get Lucas dynamo into life. Living in Chile and owner of 16 classic british bie projects, this information comes as a ring for the finger to me. The “5” you mentioned at the beginning, means the month of production. Maybe you can help me with a problem I have with my 1957 Matchless G-11 600cc twin. A mechanic here in Denver was converting it to 12V for me but bailed out on the job (and out of town), leaving me with a dynamo that was shoddily altered. (He apparently put the wrong drive-end plate on it — the drilled & tapped hole for the mounting screw is in the wrong place for a Matchless G-11.) Also, the commutator end plate is warped. So I need to know the Lucas parts numbers for those two items & also any suggestion on where to find them. The parts list for my bike shows the dynamo as a Type E3-L-L-I-O (Lucas Number 20009-B). Thanks for the article. The dynamo on my old 1929 Royal Enfield stopped charging on the way back from a Boxing Day Meet last year. I found a loose wire and reconnected it, checked all the other wiring but couldn’t get the blighter to charge. Expecting to have to remove it (always a pain with a mag dyno as you need to retime the ignition..) I tried the tests you suggested – the resistabces checked out OK. As a last resort, I repolarised the field coil and now have a working charging system! I can ride at night again. Thanks you, and I owe you a pint if you are ever in Bristol. I have a 1949 rigid framed model 16 AJS. It is fitted with a Matchless G3L engine. number41 G3L 40612. The dynamo is mounted above the gearbox. The dynamo doesnt seem to be charging, I have followed your notes with regard to testing the output, my digital voltmeter was reading .75 volt, I have tried flashing it, no better. I would now like to remove the dynamo from the bike, what do I need to do to do this, my handbook is of no help, do I need to dismantle the primary side to get it out to bench test it. Thanks for any help you can give me. Thats what I feared, I will report back in due course, I have spoken to the guy I bought the bike from, he had it for thirty years before I bought it, he tells me it had a new dynamo 2 years ago and has done less than 500 miles since, I wouldnt have thought much could go wrong in that time. I find your tutorials very clear and easy to follow. I’ve just got a 47′ G3L, and I’m fixing it, slowly, since I don’t know much about motorcycles, but I enjoy it! Now I’m interested in making a new wiring harness and (maybe is a stupid question), how do you know if the motorcycle is negative or positive earth? If I want to convert it to 12v with the DVR2, would I need to order a negative or positive one? I have a 1958 Velocette 350 Mac with Luca sE3L dynamo that has been serviced/re-built. On starting the engine the horn and lights would not work. After stopping the engine and waiting 10 minutes the horn and lights worked again. I then took advice and was told to repolarise the dynamo which I did following your excellent article. I now have working horn and lights but no charge. What do you think is the problem? Can you please help I have read the above and its very helpful .My problem is that I have a bosch mag dynamo negative earth(not on a matchless) and have polarised /flashed the positive side several times but can not reverse the polarity. Cheers Antoine, glad the info was useful! James, just thought I would drop a note of appreciation for your insight to Lucas. Picked up a 16 MS with someones idea of wiring. Rewired with the DVR2 and hid it in the headlamp nacelle, started the bike, nothing in the way of charging. Polarised the positive earth version to field, charges great. Now looking for a 500 cylinder and head seems like a traditional upgrade then the supercharger! Great article. Before I remove my A10 1960) dynamo, I had a question as to what could cause the headlights to be OK until I rev it higher than normal 50 mph running, battery won’t maintain charge. Two regulators, on brand new, same results. 6 volt pos ground. OK for normal riding, but have to idle high at stops to keep lights on. Pete J.
I have another question is it bad to Nickel Plat my dynamo can it make it less Efficient or even lead to dysfunction ?? Your advice re Delinquent Lucas 1954 aerial square four 60 watt Dynamo masterly. Just needed to identify the field coil wire correctly . It was on the right not left in my Dynamo. The telling sign you could put in your advice for othe dynamos is that the wrong contact to use for a remagntisation leads to a carbon brush and the right contact leads deep into the animal. All is plus four on the ammeter now ! Ex Vincent owner learning to love a square.Roger. Great information and thank you you may have just saved me over £200 ???? I have tested, stripped my dynamo and re-polarised it and as it is off the bike I am struggling to spin it at what might be engine revs but I have been able to get it now to “motor ” by earthing it and applying current to the “D” terminal, does this mean it is OK ? Or do I need to do the other tests? Hi Sam. Glad you found this info useful (you can buy me a beer one day!). Getting the dynamo to motor is a good sign, but not conclusive that all is well. The problem is that the momentum of the spinning armature can be enough to keep the dynamo ‘motoring’ past a duff commutator segment. A dynamo that won’t motor won’t generate either. But a dynamo that will motor still may not generate, or else may not generate at full output. Performing the load test (by connecting a headlamp bulb) is probably your next best step. Thanks for your reply, i have just tried the load test and not a glimmer, looks like the bank balance will take another hit ! Many thanks for your article. The testing data was very helpful in checking the components of the 6v 48W E3HM dynamo on my pre-war Triumph, which indicated that nothing was noticeably amiss. Yet, although it happily motored when connected to a 12v battery, it still didn’t deliver a single volt on a test setup on my lathe. However, looking through the various posts I suddenly realised that it was motoring in a CCW direction, whereas it should have been in the opposite direction. I, therefore, took your suggestion of swapping the brushes over (it was easier to do that than to stretch the shorter of the two field coil wires). It now motored in a CW direction. As a precaution, I ‘flashed’ the dynamo for +ve output and then re-ran the test again on the lathe with a 12v bulb connected between the D & F terminals and an earth point. I’m pleased to say that there was light. The dynamo has been refitted to the bike and is charging as it should. Excellent article thank you. I thought I had successfully rebuilt my 1929 Lucas MagDyno when I got 13 volts across the main contacts. Then I linked the contacts together, following your advice, and got zero voltage. Can you please suggest what I have done wrong? Just got my old Panther dynamo going thanks to your very helpful instructions. Now puts out 10 V with only a small rev increase above tickover, so I think it may probably be able to handle a 12 V conversion. 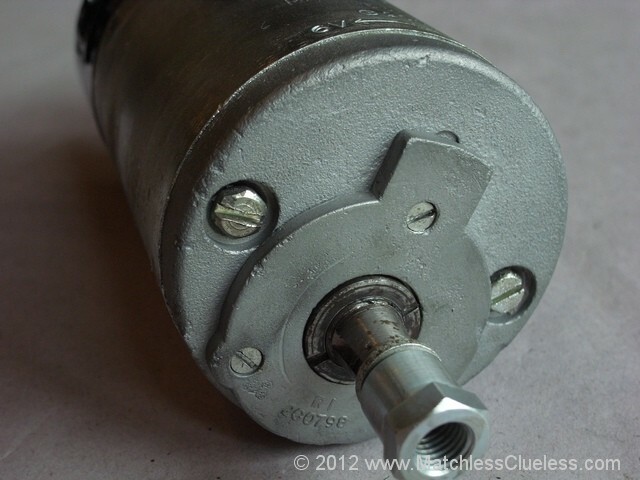 I rebuilt my E3L dynamo with a new armature etc – first test showed about 14v with D and F connected – brilliant – but later only .15v – Had it tested by an expert and was told that there was nothing wrong – so I retested and still virtually zero. Cleaned and bedded in the brushes and finally get 6.5v using a 1500 rpm drill but not the 14v I had before – Bike (BSA B33) is now 12v neg earth – how can it charged a 12v battery if it wont go over 6.5v – or will it rise as it revs up? What a superb tutorial you’ve written! I managed to kick my ’52 triumph tiger’s charge system back into life, blooming strong it is too! Usual stuff, cleaning regulator contacts, dynamo armature, brushes and some electrical contacts that were the colour of the statue of liberty and there was nothing. I re polarized the dynamo following your instructions and bingo! A strong charge even with the lights on. Thank you so much, great articles on a great website. “electrical contacts that were the colour of the statue of liberty” – what a great way of putting it. I can just imagine what they looked like! articles here. Your website can go viral. You need initial traffic only. i have seen everything on ur website and appreciate ur knowledge .I want to know the gauge of wire used for winding lucas e3lm field coil and armature original by lucas company and the type of winding ie lap or wave.Exact length of wire for field coil and armature .I would be glad if u could provide this information. Hello James; after a long Canadian winter, the Lucas dynamo on my Matchless G11 CS is not producing any voltage. I assumed it simply needed re-polarization (like it did three years ago), and went through the procedure. However, after several try’s, it simply would not work. I checked the resistances of the two windings, and that for the field was 2.8 Ohms and that for the dynamo was zero (0.00 Ohms according to my accurate Fluke meter). You had stated that it should be around 0.6 Ohms, so do you think this is symptomatic of the issue? It just seems strange that it was okay last Autumn, and dead now. By the way, When I apply voltage to the dynamo, it “motors” just fine. Thanks much, and I really appreciate your web site. This is a great series of articles but my Dynamo is driving me mad, despite all tests. 1) I tried it “as bought” ( second hand, pretty grimy and did the “motor test” and it motored. But linking the D&F and reading off that from the neg of my multimeter would only give max 1.9 volts at say 3,000RPM when driven by my hand drill. 2)So I changed armatures to one that I don’t know for sure, but was unused NOS. Exactly the same. Tried re-polarizing it to Neg too. Still under 2 volts. 3) So I went and bought a new field coil which I fitted today. Same result. Note that I am testing the DYNO without connection to battery, dismounted from the frame and drive by a drill in the correct anti-clock direction. I am in Nairobi and all the people who knew about Lucas Dynamos are long retired and vanished. I had the same trouble. When I looked at the brushes they were heavily glazed. I used fine glasspaper wrapped round dowel to remove the glazing and that worked a treat. Maybe a bit late for you…..
Great article but what does not come out is that the rotor/armature is made up of a number of different coils which are connected via the brushes so when checking the rotor/armature you need to check them all by probing oposite contacts in the commutator they all need to be around the 0.6 ohms value. With the first one I had to learn again but then I did a second one – as spare -without difficulties. For sure this Lucas E3-device was and is still a marvel of engineering, I enjoyed working on it. Very interesting article thank you!!! 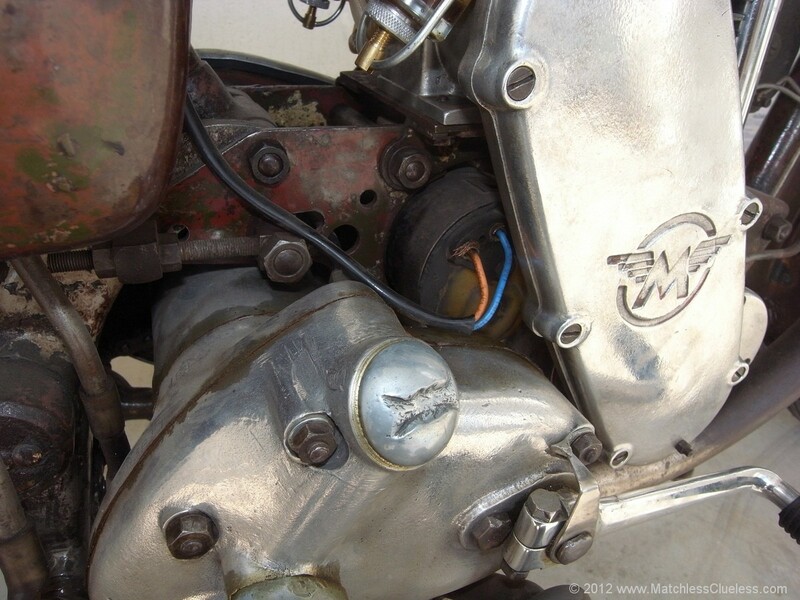 i have a 1949 Matchless 350cc G3L and have to buy a dynamo. The original on the book is a Lucas E3AR. Is there another type of dynamo that i could fit on my Matchless? without requiring too many big changes?